We are just shy of six months into this project, and were finally ready to have Kristen of K. Holly Studios come capture our new home in the "during" phase last weekend. 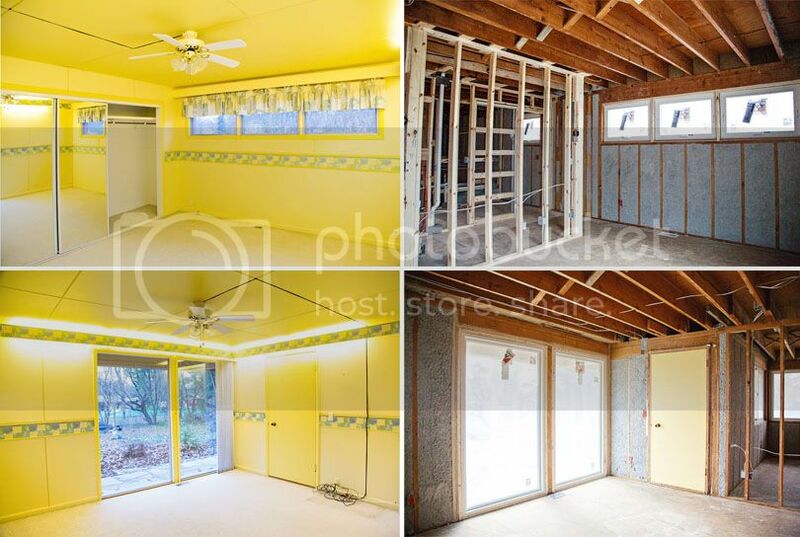 I've been sharing lots of demo photos on the Facebook page, but here are the professional images that capture the home in its best light. There are some photos that are going to be hard to understand, since we took down a few walls and rearranged things (mostly in the bathroom area...) but I will do my best to explain! You can see the full BEFORE TOUR here if you have missed it in the past. We are 8-12 weeks out from our move in date, and still have a ton to do. Drywall actually went up last week, right after these images were captured. It looks SO different already! Our current home has been on the market for two weeks with no offers yet, but showings, which makes us happy. We are thankful we still have a place to live, but nervous it won't sell before we move. This is the dining room on the left, and what it looks like now. You will now walk in the front door and instead of walking down and awkward little hallway with a non-original wall in your face, you will walk right into the dining room. When we decided to have the entire home re-drywalled down, we were taking down the drywall around the stairs, and I had the idea of opening them up instead of replacing the drywall. On the left you see the old "entryway", with the icky little bathroom on the right. In the photo on the right, you see that you will now enter the front door, and instead of a bathroom, there will be a little landing to take off shoes/hang coats. There, of course, will be a railing around the stairs! I am assuming this will be the biggest change of the house. On the left you see the old office area, which was right past the entry hallway. And on the left of the images, you will see the galley style kitchen. We have taken down the wall in between the kitchen and office area, and will have a much larger kitchen, with an island under the beam. Plenty of work space for both Greg and I, and a counter-height island for informal meals (most of them, I am sure! ), homework, and chatting. I know we are going to spend tons of time in here. The kitchen looks out onto the patio. This isn't changing much - same lights, same sliders, same floor. Right now, as you see on the right, it is our "clean" storage area, as the rest of the house is covered in dust & debris! Our garage is attached to the house, which is a huge upgrade from our current home. Because we needed to move the laundry area out of the bathrooms, we decided to take up 42" of the garage and move it out there. I love the thought of main floor laundry! So, in the photo on the left, you see the old built in workbench? That is where the new laundry/mudroom is in the photo on the right (taken from the kitchen inside). We will be stacking our washer & dryer to make this room work, but we are just happy to have everything right in one spot. The Bedroom with One Window is what we call this one. Nothing crazy - just a pretty standard bedroom. This will be our guest room for now (and another child's room if we ever have more kids), and also our office. The closet will contain all of my work files, linen samples, etc. and I'm hoping my desk will work perfectly under the window, as it looks out into our backyard! And this is the bedroom we call The Bedroom with Two Windows, also known as Eames' new room. Slightly smaller than The Bedroom with One Window, but the corner windows are awesome, and his vintage MCM bedroom set we purchased from friends of ours will be perfect in here! His little full-sized bed has a headboard that doubles as a bookshelf - ooh, I LOVE IT! And the master bedroom? Ooh, the yellow is GONE! (except that door...which will be gone soon, promise!) We actually made this room a few feet narrower to allow us to have a (small...) walk in closet. We are "less is more" when it comes to furniture in our bedroom, so we will literally have just our bed in our room - nightstands don't fit, so we ended up picking out sconces for reading lamps. The bathroom is where we went a little crazy moving around walls. The bathroom originally was a laundry room (with exterior door) and a bathroom at one time. The owners before us, made it one giant room and it was awful. We decided to make it into two bathrooms - hall/kid bath and master bath - plus a little space for our new closet, and then we popped the laundry into the garage. 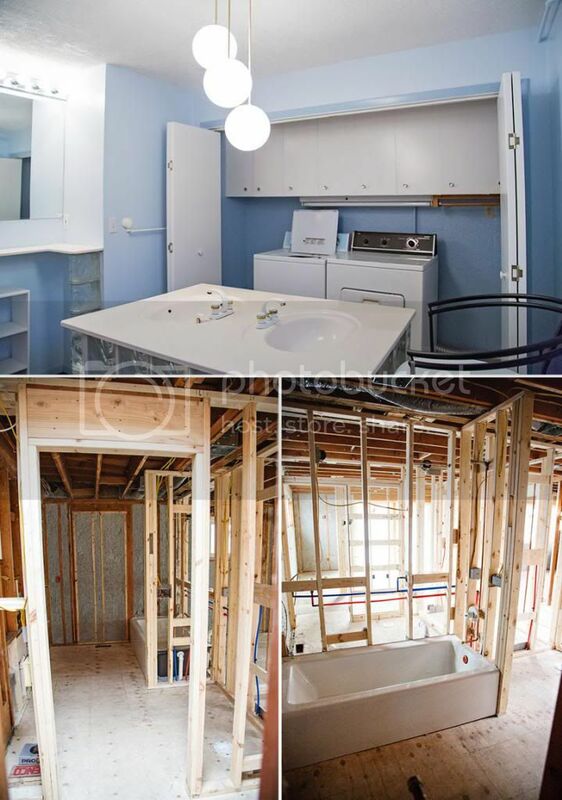 In the top photo you see the washer & dryer. That is exactly where the hall/kid bath vanity will be (across from the tub). The master bath is actually smaller than the hall/kid bath, but that is okay with us, since we're not huge bath/spa people. We would have rather had a walk in closet to eliminate furniture that will collect crap & dust, than a giant soaker tub! And I LOVE that Kristen captured some of the details here! There are many things going on at the house - here's the old thermostat on the left. We will be replacing it with an energy efficient NEST, which we are so excited about. We splurged on the NEST, but know it will save us tons of money as it learns your patterns and keeps your home toasty when you're home, but cooler when you're away. With us trying to make this home more energy efficient since heat is not free for us, this made the most sense. The new windows will help with this as well - as well as the insulation! Since we ended up taking down all of the old drywall, all new electrical had to go in. 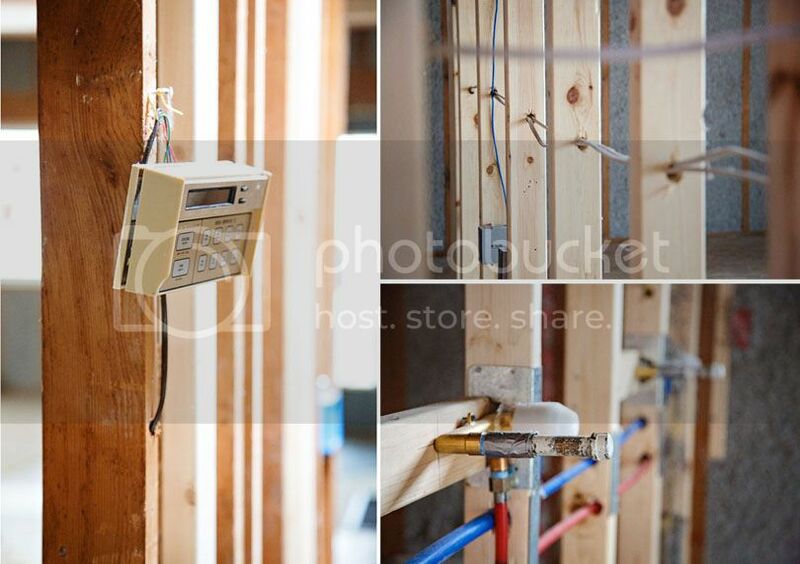 In the top right photo, you can see lots of new cords going thru the 2x4 walls. We are SO thankful we decided to do this - I am not sure how the house hadn't burned to the ground in the past 50+ years - the wires were an absolute mess and unsafe! The bottom right photo is the new plumbing in our bathroom. Since we had limited space in the bathrooms, our vanities are only 18" deep. We opted for wall mounted faucets to keep the countertops clear of extra items. If you have been following along with me on Instagram or Facebook, you know that Eames has been with us this entire time. Every weekend we have spent at the house, he's been there. We are thankful for our new neighbors for letting us use their bathroom, but for also letting us play with them! Eames usually lasts a couple of hours, but then we head over to play with their Thomas the Train, Legos, and Playdoh while Greg works alone for a bit. Kristen captured him helping a bit while she was there. 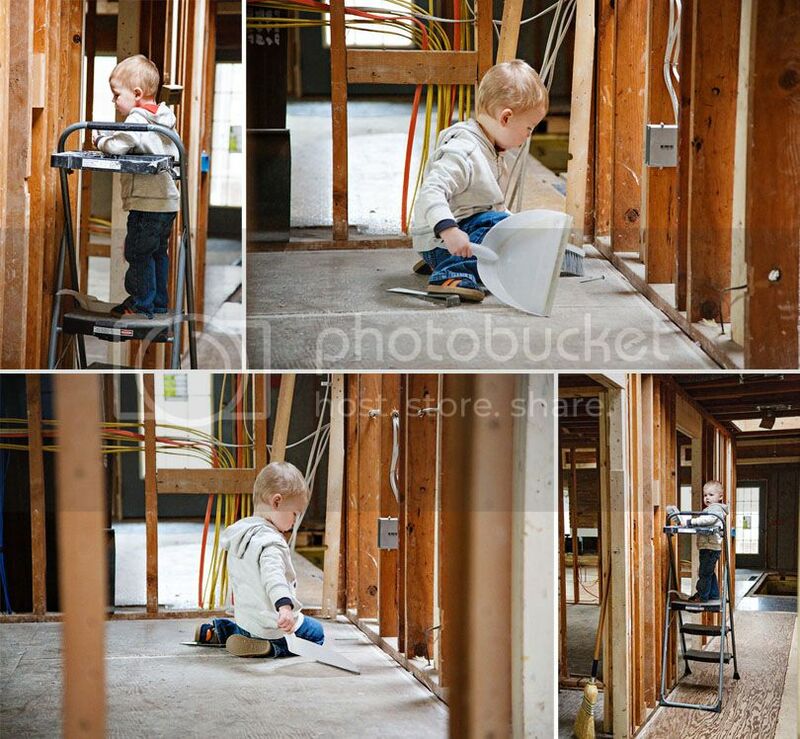 He's sweeping up some debris - takes after his dad for sure! Last fall, we spent the first two weekends at the house raking the massive amounts of leaves that were in the yard. Then, my dad gifted us a ton of his time to take out the way-too-overgrown shrubs and start thinking up a plan for our yard for spring. This spring, Greg will be working alongside him to turn the much-too-large beds of plants into grass and more "play area" for Eames. My dad has also been working on getting a ton of "scrub" trees out of the backyard, which will then become more usable for our family. Greg and my dad will start working on the grass when it gets just a touch warmer - we are SO excited for our much larger yard, and with a little boy who LOVES to be outside, it's going to be perfect for him! Same side of the house, different views. This is outside the Bedroom with Two Windows, and the master bedroom. The before on the left shows the GIANT overgrown shrub at the corner of the house, and all the random plants the former owners had outside the master bedroom windows. We removed that all last fall and the plan is to plant grass. 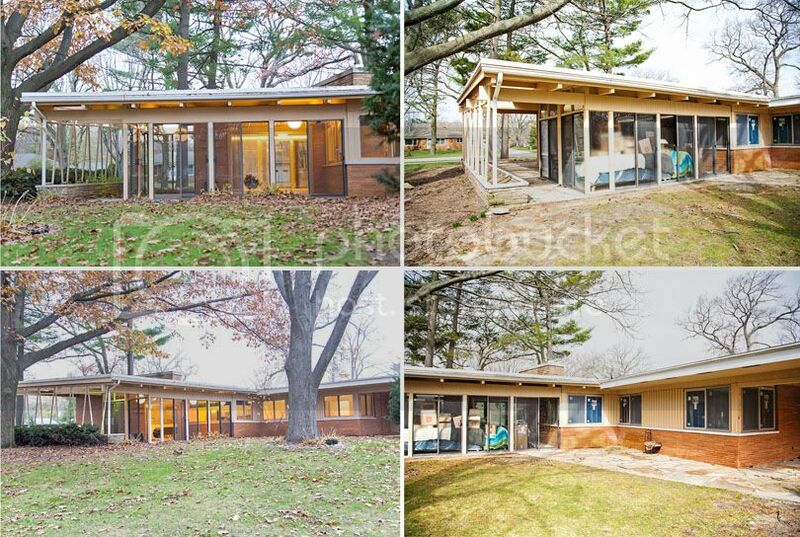 The exterior door in the right photo goes into our master bedroom - I imagine coming out this door a lot while Eames is playing in the yard. We found a great little patio set for out here - and if we don't have a ton of mosquitoes on lovely summer nights, I assume we will be out here often before Eames' bedtime!